Risk of febrile neutropenia should be systematically assessed, with consideration of patient-related, cancer-related, and treatment-related factors (evidence-based; evidence quality: intermediate; strength of recommendation: strong). Antibiotic prophylaxis with a fluoroquinolone is recommended for patients who are at high risk for febrile neutropenia or profound, protracted neutropenia (eg, most patients with acute myeloid leukemia/myelodysplastic syndromes or hematopoietic stem-cell transplantation [HSCT] treated with myeloablative conditioning regimens) (evidence-based; evidence quality: high; strength of recommendation: moderate). Antibiotic prophylaxis is not routinely recommended for patients with solid tumors (evidence-based; evidence quality: high; strength of recommendation: moderate). Antifungal prophylaxis with an oral triazole or parenteral echinocandin is recommended for patients who are at risk for profound, protracted neutropenia, such as most patients with acute myeloid leukemia/myelodysplastic syndromes or HSCT. Antifungal prophylaxis is not routinely recommended for patients with solid tumors. Additional distinctions between recommendations for invasive candidiasis and invasive mold infection are provided within the full text of the guideline (evidence-based; evidence quality: intermediate; strength of recommendation: moderate). Prophylaxis (eg, with trimethoprim-sulfamethoxazole [TMP-SMX]) is recommended for patients receiving chemotherapy regimens associated with > 3.5% risk for Pneumocystis jirovecii pneumonia (eg, those with ≥ 20 mg prednisone equivalents daily for ≥ 1 month or those receiving purine analogs) (evidence-based; evidence quality: high; strength of recommendation: strong). Herpes simplex virus–seropositive patients undergoing allogeneic HSCT or leukemia induction therapy should receive prophylaxis with a nucleoside analog (eg, acyclovir) (evidence-based; evidence quality: high; strength of recommendation: strong). The Expert Panel also supports other vaccination recommendations for immunosuppressed adult oncology patients that are contained in the IDSA guideline for vaccination of the immunosuppressed host  (consensus based; evidence quality: intermediate; strength of recommendation: moderate). In the absence of an alternative explanation, clinicians should assume that fever in a patient with neutropenia from cancer therapy is the result of an infection. Fever in neutropenic patients is defined as a single oral temperature of ≥ 38.3°C (101°F) or a temperature of ≥ 38.0°C (100.4°F) sustained over 1 hour. Patients who present with febrile neutropenia within 65 weeks after receiving chemotherapy should be assessed within 15 minutes after triage. Patients with a flulike illness in the setting of seasonal community-acquired respiratory illnesses should have a nasopharyngeal swab obtained for detection of influenza. In some of these cases (eg, patients with hematologic malignancy and hematopoietic stem cell transplantation [HSCT], strong consideration should be given to obtaining expanded viral panels for detection of additional respiratory viruses: influenza virus, parainfluenza virus, adenovirus, coronavirus, respiratory syncytial virus, human metapneumovirus, enteroviruses, and rhinovirus. Clinical judgment should be used when selecting candidates for outpatient management. Patients with significant co-morbidity may not be candidates for outpatient treatment, even if their MASCC score is ≥ 21. In patients with solid tumors who have undergone mild- to moderate-intensity chemotherapy, who appear to be clinically stable, and who are in close proximity to an appropriate medical facility that can provide 24-hour access, the Clinical Index of Stable Febrile Neutropenia (CISNE) may be used as an additional tool to determine the risk of major complications. Patients infected with fluoroquinolone-resistant, gram-negative pathogens that are also coresistant to β-lactams/cephalosporins should receive inpatient treatment with a carbapenem-based regimen that likely requires multiple doses per day. Patients colonized with, or suspected of having methicillin-resistant Staphylococcus aureus (MRSA), vancomycin-resistant enterococcus (VRE) , or Stenotrophomonas maltophilia infection should be considered as candidates for inpatient management. Patients undergoing HSCT or induction therapy for acute leukemia are unlikely to be appropriate candidates for outpatient therapy. Other antimicrobials (eg, aminoglycosides, fluoroquinolones, vancomycin) may be added for management of complications (eg, hypotension, pneumonia) or if antimicrobial resistance is suspected or proven. Vancomycin (or other agents active against aerobic gram-positive cocci) is not recommended as a standard part of the initial antibiotic regimen for fever and neutropenia; such agents should be considered for specific clinical indications, including suspected catheter-related infection, skin or soft-tissue infection, pneumonia, or hemodynamic instability. VRE - Llinezolid or daptomycin.○ESBLs: Consider early use of a carbapenem. Patients should be observed for ≥ 4 hours before discharge. Patients with febrile neutropenia who are at low risk of medical complications, in whom fever is responding to inpatient IV empirical antibiotic treatment, and hwo remain clinically stable, are considered eligible for transition to an outpatient regimen. What guidelines have been published on the use of antimicrobial agents in neutropenic cancer patients? What are the ASCO/IDSA guidelines for antimicrobial prophylaxis in neutropenic cancer patients? What are the ASCO/IDSA guidelines for outpatient management of fever in neutropenic cancer patients? What are the ASCO/IDSA guidelines for the initial assessment of neutropenic cancer patients? What are the ASCO/IDSA guidelines for the risk assessment of neutropenic cancer patients? What are the ASCO/IDSA criteria for discharge and outpatient management of neutropenic cancer patients? What are the ASCO/IDSA guidelines for the use of antibiotic agents in neutropenic cancer patients? What are the ASCO/IDSA guidelines for the monitoring of outpatient treatment of neutropenic cancer patients? What are the ASCO/IDSA guidelines for inpatient treatment of neutropenic cancer patients? [Guideline] Taplitz RA, Kennedy EB, Bow EJ, Crews J, Gleason C, Hawley DK, et al. Antimicrobial Prophylaxis for Adult Patients With Cancer-Related Immunosuppression: ASCO and IDSA Clinical Practice Guideline Update. J Clin Oncol. 2018 Sep 4. JCO1800374. [Medline]. [Full Text]. [Guideline] Taplitz RA, Kennedy EB, Bow EJ, Crews J, Gleason C, Hawley DK, et al. 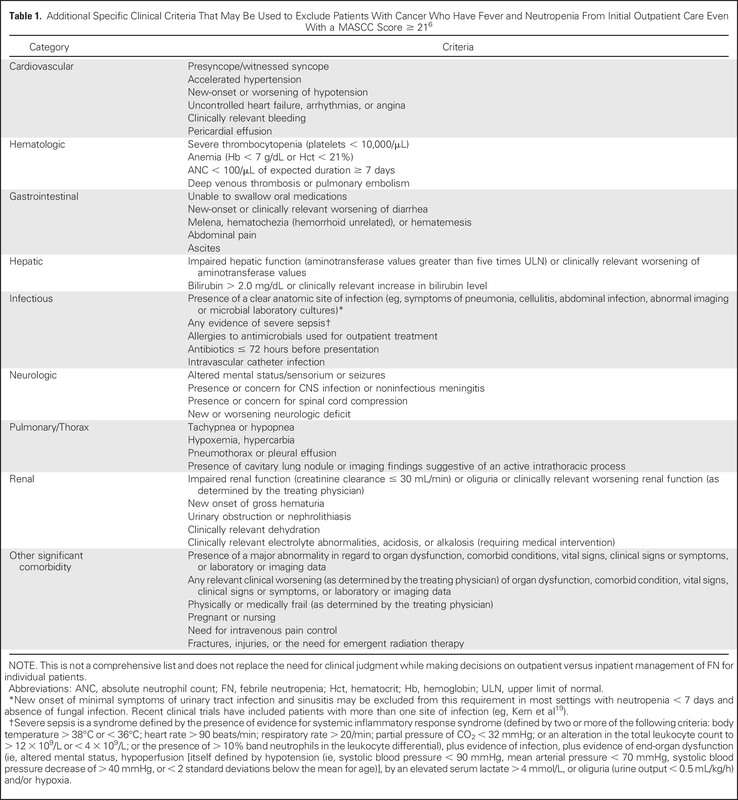 Outpatient Management of Fever and Neutropenia in Adults Treated for Malignancy: American Society of Clinical Oncology and Infectious Diseases Society of America Clinical Practice Guideline Update. J Clin Oncol. 2018 May 10. 36 (14):1443-1453. [Medline]. [Full Text]. [Guideline] Rubin LG, Levin MJ, Ljungman P, Davies EG, Avery R, Tomblyn M, et al. 2013 IDSA clinical practice guideline for vaccination of the immunocompromised host. Clin Infect Dis. 2014 Feb. 58 (3):309-18. [Medline]. [Full Text]. Disclosure: Serve(d) as a director, officer, partner, employee, advisor, consultant or trustee for: Merck Sharp & Dohme, Mundipharma<br/>Serve(d) as a speaker or a member of a speakers bureau for: Merck Sharp & Dohme, Mundipharma.